What have I been up to this week besides freezing? Not much. I must be cold blooded, because just like my tortoise, Thumper, I slow down when it gets cold. 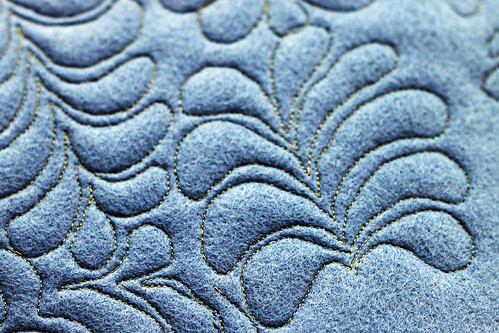 I did manage to try free-motion quilting using the fabulous BSR (Bernina Stitch Regulator). That attachment does make it much easier to go from never sewing without feed-dogs to free-motion sewing. I tried to stitch without it, but that did not go well for me. 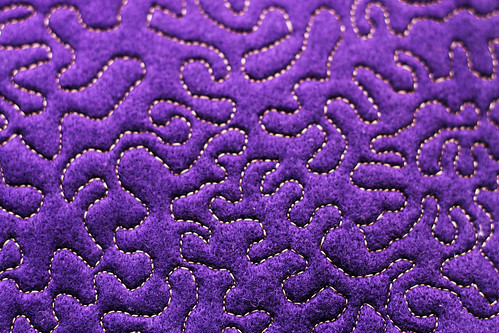 I like that even though I am not perfect at moving the fabric at a constant speed, I still get reasonably even stitches. I am getting better but still need a lot more practice before stitching on a project. I read a tip that suggested using felt to practice. I had lots of old acrylic felt left over from Alex’s elementary school days. I like that I didn’t have to use any fabric to practice on. Actually felt may be easier to stitch too. Please do not judge these samples harshly. I am a total novice with this type of sewing. It is going to take me a long time to get the hang of it. I had to break some old sewing habits. One was keeping the fabric oriented in the same direction. I am use to turning the fabric to go in the direction I want to sew. The BSR has two settings. I am only able to use setting #2 that allows for short stops. Setting #1 will sew in place if the fabric stops moving. I need to stop and think to get a corner, otherwise I get a rounded shape. Someday I hope to work up to setting #1. Using setting #2 a button needs to be pressed to tie off the stitching. Something that doesn’t bother me now, but I can see it being time consuming if I were to quilt a large quilt. Here are some photos. The first one is of the pile of samples. 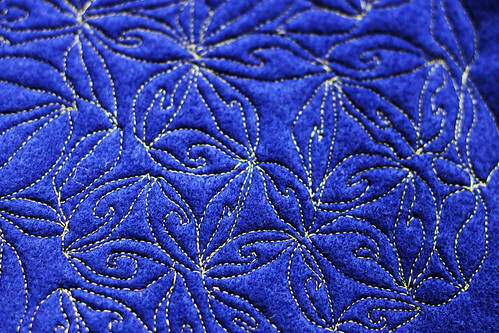 The others are closeup of some motifs I tried. This entry was posted on Saturday, January 23rd, 2010 at 3:00 am and is filed under Bernina 830, Craft, Embroidery, Quilting and Sewing. Tagged: Craft, Quilt, Sewing. You can feed this entry. You can leave a response, or trackback from your own site. Joyce your samples are AMAZING! You did such a great job. 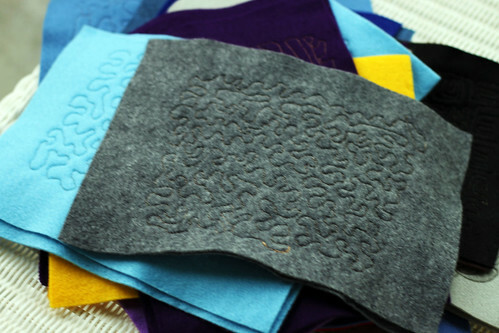 You need to move on to quilts because you are SO ready to go! I second the comment that the samples are amazing! Regarding tortoise like reaction to the cold: we had snow on the ground for over a week. Snow is extremely unusual here. The first 2 days were fun and then I felt like I could hardly move. Everything took much longer than usual, and was more difficult. So pleased when it melted. Hi Joyce – those samples are impressive – really like the feathers too. I noticed on my Bernina when using the tie off feature (knot) it gives me a little lump on the back of the quilt so wonder what I am doing wrong? 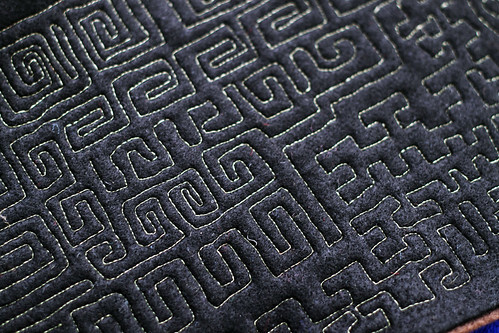 Someone suggested dialing down the stitch length really low and ending your quilting line in that manner vs. sewing back over previous stitching. That works better for me but still doesn’t answer the lump with the knot feature. 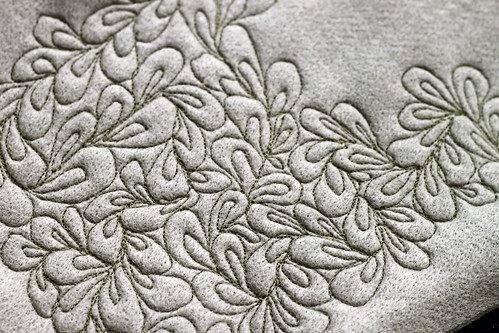 I continue to struggle with my BSR – probably because I did free motion quilting for a number of years without it. I have to learn this new gadget from square one. We are watching the awful rains and mudslides – hope you are not affected by all that. We have fog, wind, and icy mist – a real mess. Take care and stay snug. I think those practice pieces are just wonderful! Great samples. What inspiration. I’m working on my first quilt, and even though I’m nowhere near the final quilting, your samples give me ideas!! !